Young at heart but all wrinkled up? Maybe it’s time for you to look to cosmetic rejuvenation techniques that can truly reflect the young spirit that you are. Many facial wrinkles form when we use our muscles to make facial expressions. These expressions are referred to as ‘dynamic’ wrinkles. Overtime these expressions form ‘static lines’ on our face which means they are wrinkles that are present even with no muscle movement. For example – We sometimes see people with a permanent frown on their forehead, they are actually not frowning but the muscles have got accustomed to the wrong expression. This together with environmental factors, like exposure to sunlight, smoking and stress, all contribute to the creation of wrinkles and folds. These injections contain a natural, purified protein that relaxes dynamic wrinkle-causing muscles, creating a rejuvenated appearance. 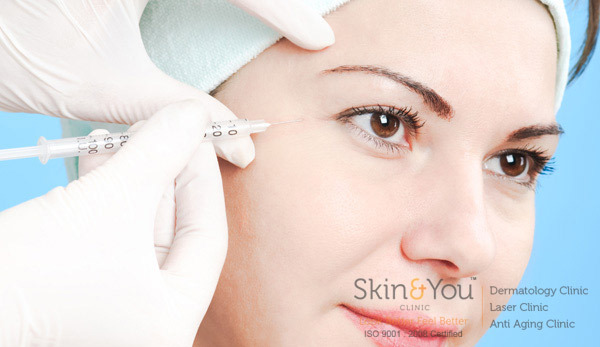 Anti-wrinkle injections can be used to relax specific facial muscles that cause dynamic wrinkles. Thus the lines gradually smoothen and new lines are prevented from forming. The Procedure – The treatment is a non-surgical procedure whereby a small amount of protein is administered by injections with a fine needle into selected facial muscles by a trained doctor. Normal activities can be resumed soon after. See Quick Results – Within 3 days you may notice a softening in the appearance of your frown lines between your brows and it takes up to 7 days to see the full results. The area will continue to improve for up to a month. Headache, burning or stinging at the time of injecting. Possible bruising or swelling at the injection site. Very rarely, eyebrow drooping or eyelid drooping is seen, but this is short term. An Old and Tested Treatment – Botox treatment has a proven 20 years safety record and has been effectively used in millions of patients worldwide. Before and after the procedure avoid or discontinue the following medications – Ibuprofen/Aspirin, Ecosprin, and Vitamin E.
Take Arnica tablets, for two days before and after the treatment. Do not exercise or swim on the day of your Botox treatment. Do not massage or manipulate the injected area for 48 hours after the treatment. Do not sleep, lift or bend for 4 hours after the treatment. Do not take steam or saunas or any facial treatment for at least 2 days after the treatment. You will need a follow-up session after 7 days, to assess the results. A touch-up session can be done on the same day. You will need a follow-up session after 4-8 months, please schedule a consultation before the treatment required. Why Skin & You Clinic for Botox Injections ? Botox is a purified protein in minute injections it helps to smoothen fine lines and wrinkles and give you a flawless complexion. Unlike myths Botox is safe, painless lunch time procedure the results are visible within 3-5 days of the injections. It is not a permanent solution as touch up is required every 3-5 months.